The future of Europe will be shaped in Ukraine. Because Russia, which is fighting in Ukraine, thinks beyond borders. 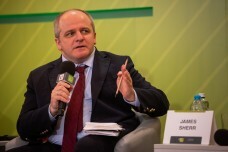 This was stated by Mr. James Sherr, the Associate Fellow of the Russia and Eurasia Programme at the British Royal Institute of International Relations Chatham House at the 12th Kyiv Security Forum, organized by the Arseniy Yatsenyuk Open Ukraine Foundation. The expert began with emphasizing predominance of regional problems on the continental ones within this part of the land area. "I have always emphasized the priority of the Eastern European consensus over the pan-European. There are not so many of these countries - the Baltics, Poland and Romania. They are characterized by the "Ukrainian consensus" - that is an understanding of the rooted nature of Ukraine in European values. "War is not only about Ukraine. Russia thinks outside the borders, as it has repeatedly stated and demonstrated in practice," Mr. James Sherr said. Mr. James Sherr is rather skeptical in assessing Western actions within the Ukrainian issue. "The West has done a lot, but not enough. Let's look at the crisis in the Sea of Azov. The West should immediately impose sanctions on Russian ports in this region. 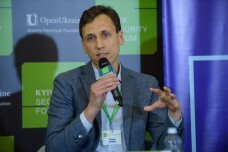 We would be able to protect Ukrainian Berdyansk on Azov, but did not do that," the expert stated. In his project the future, Mr. James Sherr noted that the West still did not have an unequivocal understanding of where Ukraine would move on. "Even after 2014, which consolidated the Ukrainians, we see a fundamental mistrust between the government and society. This is what worries Europe, especially, its central part. Ukraine’s vulnerabilities are not in the military sphere - here it can always be helped. But the situation inside Ukraine is that it is able to come under Russian influence at any time, that will divert resources from building a state according to Euro-Atlantic standards. Elections in Ukraine have shown that there is a significant "gap" between words and practices. 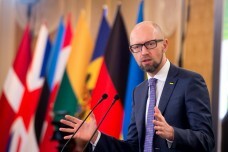 Therefore, Ukraine is once again at the point of uncertainty," an expert at the Royal Institute of International Relations Chatham House Mr. James Sherr concluded. 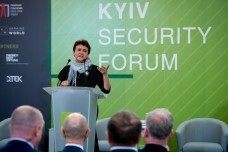 The annual international event Kyiv Security Forum was launched by the Arseniy Yatsenyuk Open Ukraine Foundation in 2007. 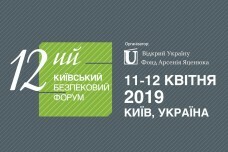 Since then, the Forum has become a platform for high-level international discussions on current issues of national security, security issues of the Black Sea region, Europe and the world.